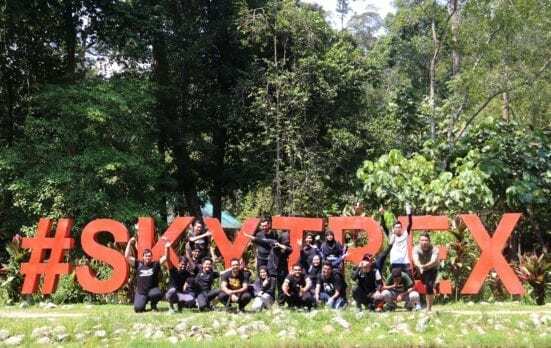 Selangor, 29th April 2018:- UTM International Kuala Lumpur had organized a Skyhunt UTM International Challenge at Botanical Garden, Shah Alam, Selangor. A total of 21 participants from Sri Lanka, Sudan, France, Egypt, Bangladesh, Pakistan and Malaysia had joined the program. The program started with a very creative challenge as their Ice Breaking game session. Students were divided into three groups and each group had to create one rap song to introduce themselves and their members. Other than creative challenge, students were tested with physical activities in the Skytrex challenge. Students were required to complete the whole courses where time was recorded to identify the winner of the game. These obstacles were divided into three courses according to difficulty levels and all participants successfully completed the hardest course in Extreme Challenge which contained a whopping 34 extremely challenging obstacles. Overall, students’ creativity and physical skills had been challenged and they had shown good leadership skills and great teamwork in completing all missions.